StorSimple solutions have been addressing some of the biggest problems faced by IT organizations – double digit data growth, storage capacity, and the data protection complexities that come with it. StorSimple 8000 series solution has addressed this problem in datacenters by storing the most used data on-premises physical array and tiering cold unused data automatically to the cloud. Customers have requested the ability to use StorSimple solutions in their remote and branch offices for a smaller amount of data and have a native file server capability. We announced the StorSimple Virtual Array general availability in March of 2016. StorSimple Virtual Array is a software version of the StorSimple solution designed specifically to address the data growth problems in smaller remote and branch office scenarios. The virtual array is implemented in the form of a virtual machine that runs on a hypervisor (Hyper-V or VMware) in your branch and remote offices where deploying a physical appliance is not practical as the amount of data managed is small (500 GB to 5 TB). The StorSimple Virtual Array can be configured to run as an iSCSI server or as a native File Server. Check out the StorSimple Virtual Array – File Server or iSCSI Server blog post to learn more about when and where to use them. StorSimple Virtual Array addresses all these problems and provides enterprises an easy way to manage data growth, backup, recovery, and disaster recovery. The StorSimple virtual array reserves 10% of the provisioned space of a share or volume locally to serve hot data from local disk and automatically tiers the older data to the cloud. This allows users to have quick access to most used data and fetch any cold data from cloud on demand. 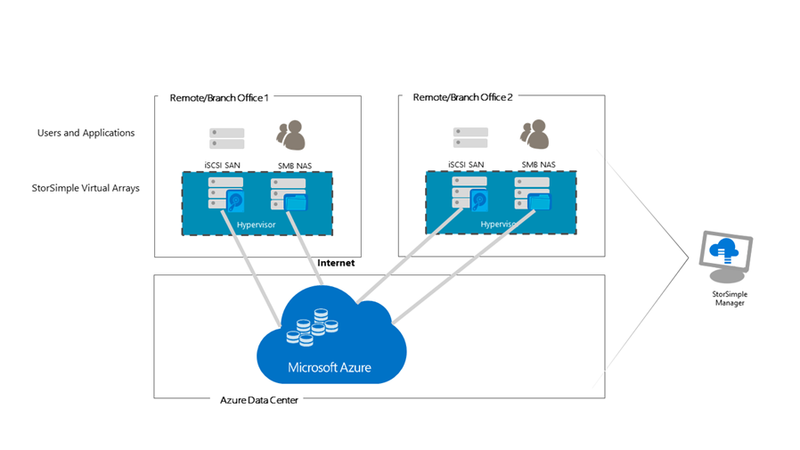 Cloud snapshots provide the daily backups of data stored on the StorSimple Virtual Array. The cloud snapshot identifies the changed data from the previous backups and transfers it to the cloud, providing a quick way to back up the data. This eliminates the need for having a backup solution and policy in the remote or branch office for user data stored on the StorSimple Virtual Array. The backups use the available Internet bandwidth to copy the data to the cloud and free up traffic on the dedicated bandwidth between the central datacenter and remote office. These backups can be used for recovery with the click of a button, which exposes a new share or volume on the same virtual array and provides the user an easy way to recover any deleted data. In a file server role, the StorSimple Virtual Array also enables the user to do self-service restores from previous five backups. In the event of a disaster, the cloud snapshots taken from the StorSimple Virtual Array provides an easy way to failover to another StorSimple Virtual Array managed by the same StorSimple Manager. The target virtual array can be running in any remote or branch office or in a datacenter. Once the failover is performed, the users have immediate access to their data. To get maximum benefits from the StorSimple Virtual Array, use the virtual array in remote offices and branch offices which meets the following criteria.